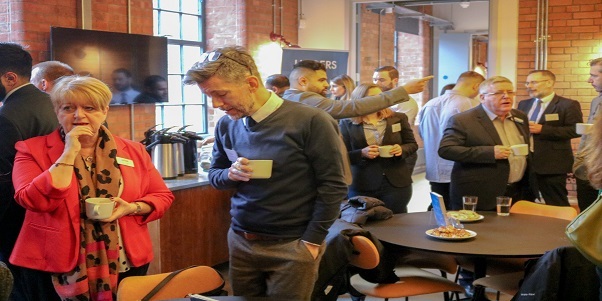 With the premier of our monthly networking event, Haiders Hub, we thought we’d share some of our tips for making the most out of your networking events. Networking is vital for any small business, as making contacts is a key part of growing any business. However it’s not as simple as showing up and swapping a few cards. You’ve got to make the right connections and remember to give people a reason to connect with you. There are a lot of mistakes that people new to this side of business can fall in to, and we hope this list can help you avoid them and make the most out of networking. Networking doesn't have to be all about business. You’re going to these events to meet people so it’s a good idea to actually get to know them. Don’t just try to talk about yourself, ask people questions to really understand who they are and what they do. As you build this connection you may notice better business opportunities than you had previously realised. A good first impression makes a real difference and nothing shows confidence and friendliness better than a smile. It will make you feel more approachable and someone that others will want to talk to. You want to make sure people remember you and your company, and a positive attitude goes a long way. Don’t try to jump into a conversation with a new topic, it’s the fastest way to kill any positive atmosphere and make people not want to talk to you. Instead, listen to the conversation for a little while and when you have something to add don’t be afraid to jump in. This shows that you are listening, engaged and someone worth talking to. Everyone at these events knows that the main reason people are there is to sell their business and the opportunities they can offer. This means there’s no reason for this to be the only thing you focus on when you meet someone new. Coming off as too salesy can be very off putting for a lot of people so try to avoid this attitude. If you’re feeling nervous about meeting new people, don’t be afraid to bring a friend. They can be from your business, someone you work with from another business or even a personal friend. It can be tricky to try and make your business sound good on your own without sounding like your boasting, so having a friend who can back you up (and you can do the same for them) can help you sell yourself a little easier. Remember that while you want to know what others can do for you, you have to show what you can do for them. Networking isn’t a one way street and you should try and build mutually beneficial relationships. Ask people what you can do for them, even just making an offer is great for leaving a positive impression. Don’t go to each event with a task that you feel you have to achieve. This can lead to you missing out on some really great connections that you weren’t expecting but chose to ignore because they weren't part of you original plan. It’s better to go with the flow than to stick to a predefined course. When you meet someone you think offers some real opportunities for you and your business, make sure you actually follow up with them. It’s not enough to just have a nice chat and swap business cards if you don’t do anything about it. Take the initiative and keep your relationship going. We all tell ourselves that we can remember something in a few hours, but how often does that actually prove to be true? Don’t leave remembering that person's name to chance, bring something with you to write on. Keep important details like what a business you plan on working with has planned for the foreseeable future, and how you can help. Bringing something like this up in a follow up email shows that you were paying attention and will make people want to work with you. At some point in the conversation someone will eventually ask you about what your business does. Have something prepared for this question, don’t try and improvise. You can adjust what you say for each person you talk to but make sure the core point of what you want to say remains intact. It’s important for each person you talk to to really understand what it is you can offer them. It doesn’t matter how many business cards you walk away with if none of them lead to anything. 1 great connection is better than 50 email addresses that don’t take you anywhere. Focus on finding that 1 meaningful connection than bouncing from person to person and not really learning anything about anyone. We hope you find these tips useful in any upcoming events that you plan on going to. We look forward to seeing you at any of our future events in 2019.